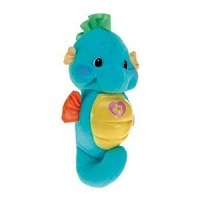 If we could recommend only one item to people considering purchasing a gift for friends or adding to their own list, the Fisher-Price Soothe and Glow Seahorse would be it. It looks great and certainly helps get little ones to sleep whilst not being irritating to parents. This gift item has been added by 26 of our members to gift lists. It was a by-chance purchase ourselves. We had recently become proud parents for the first time and happened to be visiting one of the worlds most famous toy shops. We didn't want to leave without a souvenir and noticed a huge display featuring the Fisher-Price Seahorse. The lovely pastel colours and smiling face caught our attention first and it turned out to be one of the best impulse buys we've ever made. The Soothe and Glow Seahorse plays a selection of soothing music punctuated with waves, bubbles, gurgles and womb sounds. You start it playing by pressing it's tummy and this glows whilst the music plays. It gradually fades when the music comes to an end. Although it can at first appear that there is no obvious way of stopping the music when it has been started we discovered by accident that pressing the tummy again for about 3 seconds has the desired effect. Probably the only flaw with the seahorse is that after packing a car full of items you can occassionally hear the distinctive calls from it at the bottom of the boot. It's quite easy to set off and it always seems to end up buried at the bottom! Don't ask me why! We bought the seahorse for our little boy when he was only 4 months old. It instantly became an essential part of our bedtime routine and has remained so ever since. Any attempt to start proceedings without the seahorse is met with cries of "Where's glowy?" It has a soft texture and is just the right size for him to cuddle up to. The music plays 8 tunes and a session lasts around 5 minutes. We found this about right. We have a mobile that can go on for about 10-15 minutes and whilst this usually guarantees that baby is asleep, the fact that it can be heard from the rest of the house in the quiet hours of the morning means you can be stuck with the music going round your head all day. Not so with the seahorse and if you find it not quite enough some nights the tunes are calming enough to played a second time. A word of warning to all parents. This little item is almost too effective. After a busy day looking after the little man or lady and settling down with the seahorse and a bottle you'll find the relaxing tones can work nearly as well on grown-ups! You have been warned! The Fisher Price Soothe and Glow Seahorse comes in 2 colours so you can choose either for your child. The most famous teether in the world and rightly so. A small amount of teething :-) problems does not detract too much from a great and reliable toy. © Gifts & Lists - All content included in this review is copyright of Gifts & Lists. The ultimate, free gift registry for any occassion.